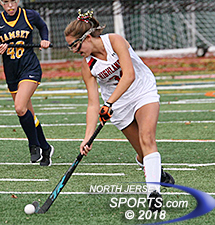 ALLENDALE – Northern Highlands was a confident bunch heading into the Bergen County Field Hockey Tournament final and for good reason. Winning 18 of its 19 games thus far this season, the top-seeded Highlanders’ moxie only grew as they quickly jumped out to a two-goal lead on archrival Ramsey. The mood was decidedly different, however, as the teams went to their respective benches for halftime. The Rams had cut the deficit to one goal and dominated the last 10 minutes of the first half, putting the Highlanders on their heels. 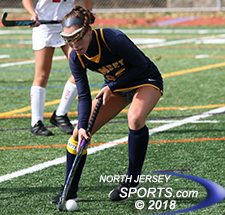 If the Highlanders were to finally get back to the mountaintop of Bergen County field hockey, they needed someone to make a play in the second half to get them going. It turns out they did not have to wait long. Rachel Scrivanich showed why she is one of the most dangerous attack players in New Jersey. Just 32 seconds after halftime, the junior found the back of the cage to provide all the breathing room needed to give Northern Highlands its first Bergen County championship since 2013 with a 3-1 win over second-seeded Ramsey on Sunday in Allendale. Jenna Doran and Ramsey will get a chance to win a title as the top seed in the North 1, Group 1 state tournament. A five-year drought without a county title seemed like an eternity for a program that had won 17 titles in the 40-year history of the Bergen County Tournament. The Highlanders set the tone early thanks to a pair of hustle plays from Riley, a sophomore, and both came in a span of 1:43. She first raced past two defenders then carried the ball along the goal line before Scrivanich tucked home her centering pass for a 1-0 lead. Riley then cleaned up a loose ball off of a corner and before the Rams knew what hit them they were staring at a two-goal deficit. The Rams played with a chip on their shoulder for the remainder for the half. Just over a minute after Riley’s goal made it 2-0, the Rams got back in it when Meggie Henry scored off of a corner. Ramsey had six more corners in the final 10 minutes of the first half and had numerous chances to tie the game. Northern Highlands’ goaltender Taylor Bechtel turned away several point-blank shots to preserve the lead going into halftime. The halftime intermission was exactly what Northern Highlands needed. Scrivanich has a knack for being at right place at right time. On the Highlanders’ first push up the field in the second half, Scrivanich found herself with the ball on her stick in front of the net. There was no hesitation as she flicked one past Ramsey goalie Erica Babbitts to put the Highlanders back in control with a 3-1 lead. Rachel Scrivanich scored her 33rd and 34th goals of the season for Northern Highlands. Ramsey made one last push following Scrivanich’s second goal of the game. Jenna Doran and Molly Henry each cracked shots from the top of the circle but Bechtel was there again to keep them out of the cage. Another key for the Highlanders was the play of holding midfielder Mikayla Walsh. She was all over the field in the final 20 minutes making plays to thwart potential scoring threats. The sophomore win 50-50 balls on a consistent basis in the second half as the Highlanders got stronger as the game wore on. When the final seconds ticked away on an elusive Bergen County title, the Highlanders poured onto the field in a celebration that was in the making for quite some time. Scrivanich scored her 33rd and 34th goals of the season to lead the way for Northern Highlands (19-1). Bechtel finished with eight saves. Libby Solleder had the assist for Ramsey (17-2). The Rams will refocus their energy towards the state tournament, where they are the top seed in North 1, Group 1. The Highlanders are also a top seed for the upcoming state tournament in North 1, Group 3. With a championship already in hand, this group wants to experience holding up another trophy.